Posted on the Division of Fire’s Facebook page on July 26, the photo shows a plume of smoke from the Liberty fire which, as of Monday morning, has burned more than 1,800 acres of Mission Mountain tribal wildnerness. 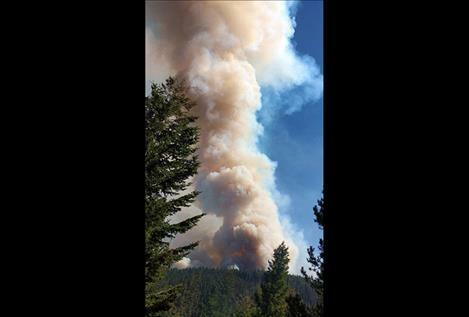 POLSON – South Lake County residents may have noticed fires burning east of Arlee, one of which may cause some Placid Lake residents to evacuate and another that burned a salvage yard. Kelly’s Auto Salvage, located southeast of town off U.S. 93, lost some 400 cars due to a fire caused by a child playing with matches on Thursday, July 27, Arlee Volunteer Fire Department Capt. Drew Hendrickson said. 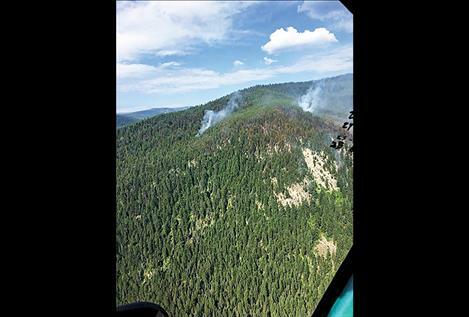 Meanwhile, three fires that were burning in tribal wilderness had merged to two by last week. Some Placid Lake-area residents located east of the Mission Mountains southwest of Seeley Lake in Missoula County were put on notice Sunday night that they might have to evacuate, Hendrickson said, noting the Liberty fire expanded four miles, had flame lengths up to 400 feet and was “spotting” a half mile ahead of the fire on Sunday. Confederated Salish and Kootenai Tribes’ fire prevention specialist C.T. Camel said the South Fork and Liberty fires were started by lightning on July 15. The two fires merged a week or so later and had burned over 1,800 acres by Monday morning. The Liberty fire, as the combined fires are now called, was zero percent contained, Camel said. What he termed a “lightning holdover fire” started on July 20. The Black fire had burned 31 acres by Monday morning and was 20 percent contained, he said. Four Type II crews were fighting the fires and were assisted by a Type I helicopter and maintenance workers. About 90 firefighters and staff were on scene, including 20-person crews each from Oklahoma and Arizona. The fires, which are southeast of Jocko Canyon Road, started about 5 miles east of Arlee in the South Fork Primitive Area, which is tribal wilderness in the Mission Mountains. Camel described the area as “pretty steep, rough terrain” and noted that firefighters were taking precautions after a 19-year-old firefighter died recently when a snag, or burned tree, fell on him in the Seeley Lake area. In regard to the salvage yard fire, Hendrickson said the call came in around 1:30 p.m. Thursday and mop up was complete by 9 p.m. A grass fire from a residence on Red Tail Lane spread under a fence to the salvage yard and did not result in any injuries to humans. He estimated about one-quarter to one-third of the vehicles in the salvage yard were burned. “We couldn’t get into the fire because of the wind,” he said, adding that about 40 firefighters from Arlee, St. Ignatius and Frenchtown were assisted from the air by two helicopters and two airplanes from the Confederated Salish and Kootenai Tribes. The aircraft dropped water and fire retardant on the fire. noting the Montana Highway Patrol and Lake County Sheriff’s Office provided traffic control on U.S. 93, which was packed due to tourists and “looky lous” slowing to look at the fire. The fire burned over six acres and caused heavy smoke. The fires came the same week that Gov. Steve Bullock declared a fire emergency in the state through executive order. The declaration allows him to mobilize the National Guard to fight fires and expend funds as needs arise. Outside of Lake County, fires were burning southeast of Superior, southwest of Lolo, and in Missoula and Granite counties near Rock Creek. The largest fire in the state is the 270,000-acre Lodgepole Complex fire burning in Garfield and Petroleum counties in eastern Montana. As of Monday morning, that fire was 93 percent contained.